Nortel Helios rectifiers and DC system components provide significant control and power distribution from multiple cabinets with support of up to 6,000 A, though auxiliary cabinets can give you additional distribution options. Protect your system and your equipment with these leading rectifiers that feature remote monitoring, temperature compensation options and battery disconnect features paired with a variety of high-voltage shutdowns, fuse and breaker alarms, failure notifications and high/low float alarms. Refurbished Nortel Helios rectifiers are designed to function with today’s best DMS and other telecommunication systems that need a -48 V DC input with current requirements underneath 6000 A.
Cabinet-type frameworks ensure the primary control and distribution cabinet, rectifiers and auxiliary distribution are all uniform and properly ventilated to protect your locations and simplify installation. Top and bottom cabling options further help you ensure your equipment is easy to manage and protect as you grow. 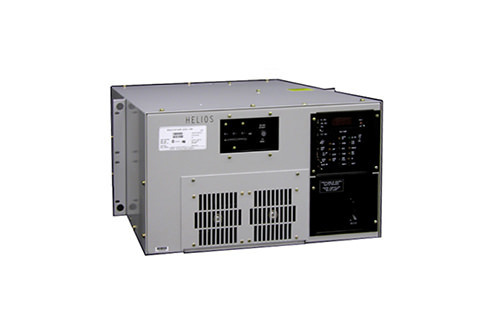 Worldwide Supply offers a complete line of used and refurbished Nortel Helios rectifiers to continuously operate your -48 V power systems, whether or not you have the space for a battery pack. Complete integration is possible even with small embedded systems, though it also supports larger power plant options. Each Nortel Helios can work in conjunction with other OEM rectifiers and conventional controllers to build out your network in a platform-agnostic way. Your next Nortel Helios features a two pole/ 45 A circuit breaker that opens both lines to protect your inputs, while output protection includes a 120 A circuit breaker. Output current is limited to a value you specify, ranging from 50% to 105% of the rectifier’s rated capacity. With a refurbished Nortel Helios from Worldwide Supply, you can expect to reach the OEM standard of an efficiency better than 88% at normal input voltage of 208/240 V AC with an output load of greater than 40 A.